The display illustrated covers which showed some aspect of local or rural post either by being used internally within the island, or, to/from rural offices on overseas mail. In ordinance No 14 of 1834, Article 3 laid down the rates of postage on incoming mail which was 6d per ½oz. It also announced that the Government were to start an "experimental" postal service between Port Louis and Mahebourg which would operate once a week from 19 May. 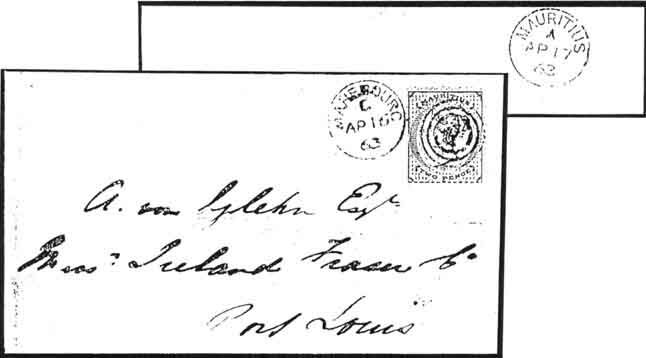 The rate for ordinary mail being laid down at 4d (no weight specified); this rate did not change until Ordinance No 13 of 1846 (introduced 1 January 1847), when the Inland rate became 2d per ½oz and Town letters at ld. 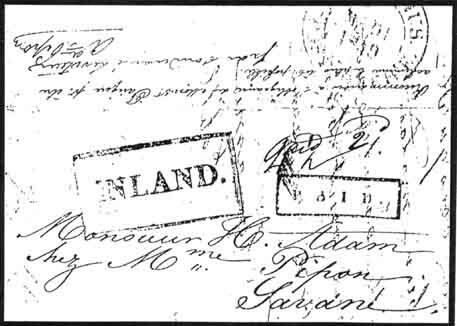 A letter from Port Louis to Mahebourg from the Bishop of Mauritius on JY 29 1840, shows no postal charges, but two letters of JY 1 and JY 24 1846 show manuscript endorsements "Post Paid 4" and "To be Charged 4d". 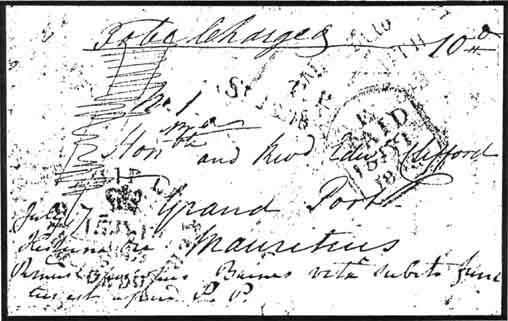 Whereas letters of 1841 and 1843 (Fig 1) to Grand Port show inward ship letter charges, plus the inland rate of 4d, the charge from Port Louis to Grand Port via Mahebourg. After the introduction of Ordinance No 13 of 1846, covers shown included the earliest recorded Town mark on a cover FE 17 1848 to Port Louis from Souillac (Fig 2), which is listed in Barnard's estimate (British Library) dated 12 November 1846, as one of the "12 Letter Stamps with Moveable dates and Names of Stations"
Two other covers of 1851 show a similar framed mark in blue for Mahebourg, plus boxed "PAID" handstamp and manuscript internal rates. 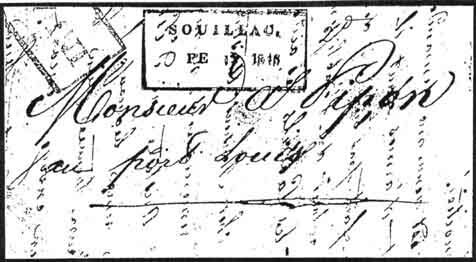 A rare framed "FREE" was shown on an 1857 letter from England, and to show no charge was to be made for a re-direction from Souillac to Ville Bague. 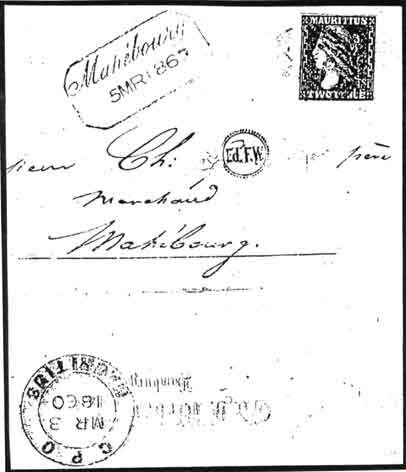 The bevelled framed handstamps of Flacq and Mahebourg were seen on letters of 1860 to France, with the latter struck on an 1860 cover (Fig 4) which showed the rare use of a 2d Dardenne on internal mail; plus another on an 1861 cover to Port Louis. 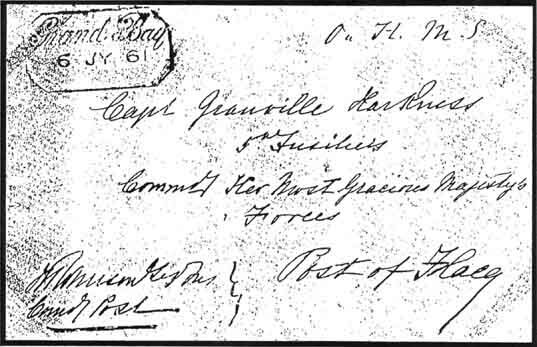 An OHMS cover to "Post of Flacq" between two Army officers dated 6 JY 1861 showed the only recorded example of the bevelled framed "GRAND BAY" handstamp (Fig 5). From the early 1860s, circular datestamps came into use with rural offices using them from 1863 onwards. 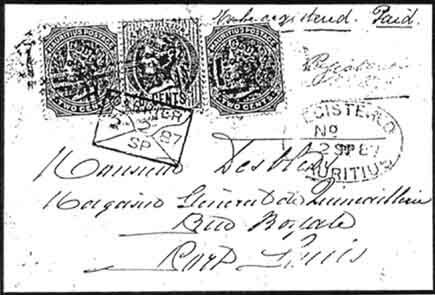 Examples were shown of Riviére du Rempart for AP 5 1863 (Fig 6) on a cover to France with the Queen Victoria stamps tied by strikes of numeral "10" in two concentric circles; Mahebourg for AP 16 1863 (Fig 7) on a local cover to Port Louis with the Queen Victoria 2d tied by a "1" in three concentric circles; a cover from Port Louis to Flacq with another 2d tied by Mauritius/B53 duplex, backstamped with Flacq AU 15 1863. The Bulletin of the Indian Ocean Study Circle, Issue No 87, April 1998.